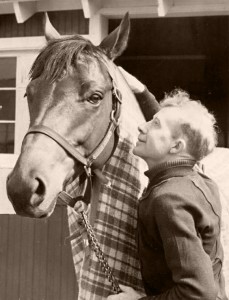 Red Pollard and Seabiscuit were viewed by many as underdogs. Pollard suffered various injuries throughout his racing career, including an injury which resulted in blindness in his right eye. He kept that a secret, out of fear that he would not be allowed to ride. Seabiscuit was small in stature and was described as having an awkward gait. This duo began to gain a large following as they started winning races together, but their racing career was not without its setbacks. At one point, both Pollard and Seabiscuit were sidelined with injuries, and it was thought that Seabiscuit would never race again. However, they both returned to the racetrack, winning the Santa Anita Handicap in 1940. In 1938, Agnes Conlon was working as a nurse at Winthrop Hospital just outside Boston, Massachusetts, when she met Red Pollard. He was a patient at Winthrop Hospital following a severe riding injury. Agnes was already in a relationship when she met Pollard, but the two fell in love. Some members of her family did not approve of the relationship; their disapproval did not stop Agnes from marrying him in 1939. They were married at Willits, California, and the reception was held at the ranch of Seabiscuit’s owner, Charles Howard. One of Agnes Conlon’s sisters, as well as my great-grandmother, Mary (Dalton) Conlon, made the trip to California to attend the wedding. A documentary on Seabiscuit was aired on the PBS television series American Experience around the time the movie was released. I watched this documentary and was excited to see a video clip of Agnes Conlon and Red Pollard’s wedding reception, since it included footage of my great-grandmother. I recently watched the movie Seabiscuit for a second time, and it sparked my interest in researching Red Pollard and Seabiscuit’s racing career using various contemporary multimedia sources. I searched the collection of videos available online through You Tube for clips of Seabiscuit’s races. In addition to videos of Seabiscuit’s races and segments of the 2003 movie, I also located several documentaries of interest to my research. Next I checked the collections available online through the Library of Congress website. Among its online collections are an assortment of photographs, historic newspapers, and maps. I located several photographs of Seabiscuit in its collection, including two photographs with Red Pollard. In the 1930s, radios became a popular fixture in millions of households. Families would gather around the radio to listen to their favorite program or sports event. A number of Seabiscuit’s races were broadcast over the radio. Available online through Internet Archive are more than six million eBooks, as well as a large number of images. In addition to these collections, this website has a number of audio recordings available online. I located a collection of audio recordings titled “Seabiscuit Horse Races, 1937-1940.” This collection contains five broadcasts of Seabiscuit’s races, including his race against War Admiral in 1938 and the 1940 Santa Anita Handicap race. As I listened to the audio broadcast of the Santa Anita Handicap race, it occurred to me that my grandparents John and Gertrude (Breen) Conlon most likely sat by their radio to listen to that exact broadcast, cheering on their brother-in-law. 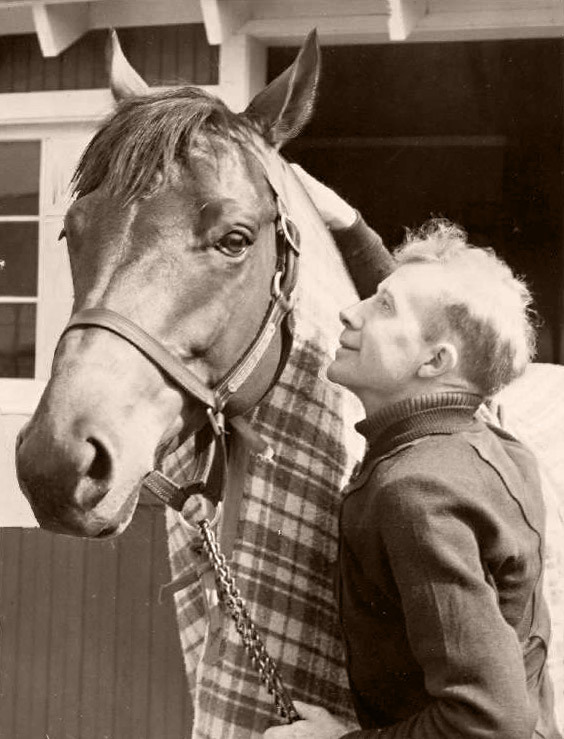 Red Pollard’s connection to Seabiscuit provides me with a unique opportunity to utilize various multimedia sources to research his career. If he was in Winthrop Hospital, and not generally from Massachusetts, but rather on the circuit, he most likely was racing at Suffolk Downs Race Course in the Beachmont / Orient Heights section of Revere which borders East Boston and Winthrop. A check into the Suffolk Downs archives may tell you more about this particular accident. Very interesting post. I worked for Bull Hancock of Claiborne Farm where Seabiscuit was born. Bull was a teen when Seabiscuit was a yearling and he took care of him along with the other yearlings. I asked him “what was it about Seabiscuit that nobody liked,” and he said he was just a scrawny little thing! It goes without saying, so pardon me for doing so, that movies and historical fiction are to be taken with a grain of salt — their authors and directors using license to make the event more interesting to his or her readers and watchers. However, as Ms. Pironti admits, she used Seabiscuit to spark her interest in locating primary sources that would provide more insight. I particularly liked the thought that families would gather around their radio to listen to programs. It has made me wonder which programs my family would have found interesting.